A couple weeks back I posted to copblock.org “Brady Cops” (below in its entirety) to solicit input from readers on how best to acquire the names of police employees known to have lied in court and thus be of questionable integrity. Known as a “Brady list” or in the ‘shire, as “Laurie list,” per a case that involved someone by that name, today, on the New Hampshire Bar Association site an opinion piece by Jeffrey M. Kaye weighed-in on the subject. While it’s a step in the right direction as it would make the process a bit more transparent, it still falls far short from what should be done – the names of so-called “Laurie cops” should be made public for all to see. 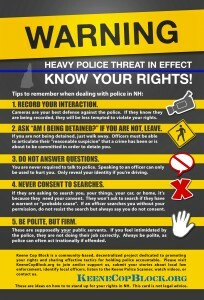 And if the police employee on that list lied in legaland, they should obviously be held accountable. Editor’s Note: Jeffrey Kaye represented Cody Eller in a criminal case that lasted more than two years before Superior Court Judge Jacalyn Colburn in April 2013 set aside the verdict based on “Laurie” discovery violations, after it came to light that the arresting officer’s credibility had been called into question. The case was resolved by a plea agreement in November. In a letter submitted to the NH Supreme Court Advisory Committee on Rules last month, Kaye suggested a number of protocols and procedures the court could adopt to ensure exculpatory evidence is disclosed to the defense in a timely fashion. The following is an edited version of that letter. The New Hampshire Supreme Court and the Advisory Committee on Rules must address and mandate procedures to be followed by prosecuting officers statewide relative to disclosing exculpatory evidence to defense counsel. From November 2012 until April 15, 2013, this defense counsel filed more than 10 motions to obtain exculpatory discovery in State v. Cody Eller. During Eller’s first trial, the court reviewed the limited material provided by the police and the county attorney’s office, which did not include any exculpatory materials that would have been favorable to the defense. NH Superior Court Judge Jacalyn Colburn, in her decision on April 16, 2013, set aside the initial verdict against Eller, based on “Laurie” discovery violations – the first time that has happened in 18 years. At what point should the defense have access to potential exculpatory and impeachment evidence in criminal prosecutions? In the prosecution of Cody Eller, former Pelham police officer Stahl, who was the prime witness, had a history, over 12 years, of a “pattern of conduct” of arresting youthful offenders, bullying them into confessions and violating their civil rights. The Pelham Board of Selectmen explicitly fired him in August 2013 for this “pattern of conduct” during a public, video-recorded termination proceeding. Unfortunately, if we looked at each isolated episode of Stahl’s misconduct, we would not see the whole picture – that “pattern of misconduct.” How can the court avoid this kind of situation in the future? Should the defense be entitled to access, subject to a confidentiality agreement, any possible exculpatory or impeachment materials, which have been produced and submitted by local police departments to the charging authority, before those materials are totally filtered? Should the court provide a defense attorney with a list of what potentially exculpatory materials the prosecution has provided to the court and which materials have been reviewed by the judge? Self-proclaimed “authorities” dictate that it’s a crime for you to lie to a police employee, but it’s permissible for that police employee to lie to you. This is demonstrative of the double-standards upon which today’s policing institution is based. 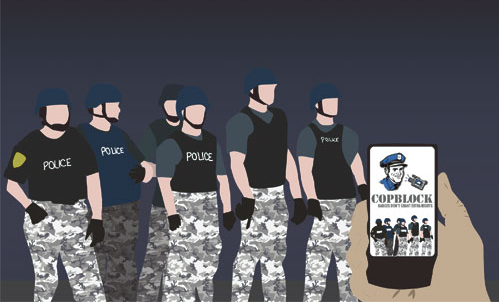 Police employees lie in conversations on the street (when soliciting information), in their own reports (to make their version of the “truth” fit the scenario), and in legaland (a practice so commonplace that it’s been coined ‘testilying’). Recently we received an email from a gentleman in Michigan who questioned how Brady lists could be obtained. I didn’t know. I looked and didn’t find a step-by-step process outlined (surprise!). Thus I was motivated to write this post in the hope that you, the reader, would have some information helpful to answer this question. Should a FOIA request be sent to each state attorney general (as they are atop the police hierarchy in each state), or to each county attorney (as the prosecutor, who’d then be privy to such info), or to each police outfit (who possess the files necessary for the Brady classification to be made), or is there another, less-laborious means? I did inquire of a lawyer bud in NH, who noted that there, the list isn’t called a “Brady list” but a”Laurie list” after the case State v. Laurie. He said each defendant had the right to such information for those who were going to be called to testify in their case at legaland, and that he questioned whether police outfits would release such information to the public, noting that it may be claimed it’d violate the police employee’s personnel file. Also, another friend is inquiring of his lawyer friend based in California on how best to proceed. 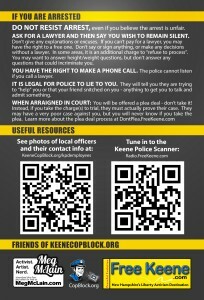 Hopefully between those leads, and the input generated from this post, a process can be determined, and the names of all known Brady cops can be acquired and posed here to CopBlock.org.